Thank G-d, all of my work was not in vain, there is now mention of Na Nach on the actual page, besides for all that was removed or deleted which B"H is going to go back up. In the discussion there is quite a bit more. There is a discussion if Breslov is Charedi, so I brought proof to the argument saying that they should not be considered Charedi from Dov Shurun's son, a Nanach currently in Brooklyn, who despises the presentation of the Charedim (even still loving every Jew, it his practice to hug them as much as possible - emulating R' Shlomo Carlbach). You seem to me like a nice guy (I've seen some of your work on the Wiki), but it's really hard for me to speak with you in this way, please if you would reveal yourself and we can discuss this properly. For the meanwhile - nanach.net as you can see is the public - as the Saba said we do not need the Rabbi's the people will choose Nanach. We published openly our intent - we are the voice of the public - and we are the living heirs to Rabbi Nachman - and thus we definitely should be all over the Wikipedia where ever there is discussion of G-d, Judiasm, Chasidus, Breslov, and Rabbi Nachman. The same way you have discovered us, and you have offered your opinion, so can anyone. That is one of the reasons why nanach.net is the authoritative source! You will find that the nanach are very particular and exact on their knowledge of what is dear and critical to them, this is another reason why nanach.net is the most authoritative. The other sources quoted in the Wikipedia are all untouchable and controlled - they are run by self interested parties, they do have an interest in Rabbi Nachman and in other things as well, like themselves and money, power etc.. They corrupt the teachings to fit their needs. Even the books authored by the late Rabbi Aryeh Kaplan OB"M, which by the way are also not %100 reliable as he has his own messages and missions such as the spread of meditation - as I pointed out already in the discussion of the Wikipedia (the truth is someone already started to point this out, except he was just a small voice, not seeming even to realize what he was up against - not just a small mistake but a very calculated and controlled one - and B"H I answered with the boom of Nanach), are in the hands of people using them for their own cause. Years ago a friend of mine offered them to pay for the publication of the RAK's translation to Sipuray Maasiyos and give it our for free or cost price, their reply was – touch it and we will sue you to Kingdom Com! Take a look at the prices of their books, they charge around %400 more than the nanach charge! 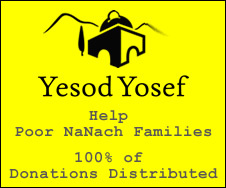 Nanach.net is completely non profit, not non profit after everyone makes their salary, no profit whatsoever, no one makes a dime, any money that comes in is for Rabbi Nachman. In addition as you can see we do not even allow advertising on our blog, because of our commitment to promoting only the complete truth. So how do you have the audacity to call this self interest?! This would be a good place for me to start calling you names – but you must have a hard enough time already, because the sources that you do like to deal with are drowning in their own projection of themselves and their sheker. We are promoting G-d and His True Tzadik, maybe you have other loyalties so you wouldn't understand, but those are ours. G-d and His True Tzadik are the absolute truth - and the truth will win in the end. It would be nice to see this Truth represented in the Wikipedia, after all even the Wikipedia is a creation of G-d. In the times we are in, it's the simple people that are starting to become very strong on the truth, so this is not a calling for some zealous or fanatic attack for the sake of G-d, it is just a call of the people to be heard expressing their true belief in G-d and His Tzadik. This should fit the function of Wikipedia perfectly! Please explain to me how we stabbed you in the back? First of all, this blog is completely open to the public, and we actually invited those at Wikipedia to the blog, so how is that considered behind the back? Second of all, how did we stab you in any way? Both in the Wikipedia and in our blog we made our objective clear, we would like proper representation of Rabbi Nachman. It this is considered stabbing you, then you must have very deviant intentions C”V. My dear Rooster, G-d forbid, I really don't want to start getting nitty gritty with you, to challenge you to answer what I have written here, that would just harbor bad feeling and nurture a fight G”F. This was just a way for me to show you our perspective, hopefully you will join our cause, at worst you will at least respect our cause and not G”F try to harm us or deter us in anyway (if you do however at least get something from those parties, don't be so lishaim shumayim while they rake it in on your account....). If you would like to further this discussion, please show me how to procede. Great blessings of Na Nach Nachmu Nachman MayUman!